What we normally think of as thinking is really just the process of keeping ourselves entranced with repetitive judgments, opinions, memories and basically just entertaining ourselves with a running commentary that tells the story of “me” and how “I” fit into the world. Eckhart Tolle says thinking is 98% repetitive and useless. We sacrifice the incredible power of our minds to process information and instead use it to filter through the information we receive so we only ever have to be confronted with “evidence” that supports our foregone conclusions. We can also distract ourselves into oblivion by playing with concepts, theories and mental puzzles that have little relation to reality. I like to think of it as a gerbil on a wheel going 90-to-nothing but getting nowhere. In the awakened Head Center, we find a specific type of stillness, receptivity and a playful wonder and delight with the workings of the universe that allow our impressions and direct experience to land within us. The innate brilliance of our inner guidance is then free to arise. From here, we see reality with breathtaking clarity and are in touch with an inner wisdom of infinite depth. When the Head Center is balanced and healthy, its Essential qualities express themselves through us effortlessly. Some of the Essential qualities of the Head Center are clarity, space, wisdom, vastness, peace, stillness, direct knowing, support, quiet mind, luminosity and wonder. Because the Head Center is our inner organ of perception and that which provides our inner guidance, the primary issue of the Head Center is that of trust and our right to feel safe. However, through the process of ego-splitting, we lose connection with our Head Center. When we’re not feeling particularly well-grounded in our sense of inner guidance and we don’t have an experience of trust that we can depend on, Ego steps in to fill the void, attempting to “fake it till we make it” with opinions, beliefs, mental chatter, strategizing, cynicism, trust of mistrust and freaking out about decisions. There’s a sense of needing to find something we can put our trust in and an urgency to find it quickly. We begin to feel vaguely threatened in some way and experience life as coming at us. Russ Hudson says it’s like driving a car at 100 mph while blindfolded. Our focus shifts to the external environment as we try to decide whether it’s a threat or a source of support. We also begin to relate to the world through our thoughts about it rather than allowing ourselves to experience the world directly. Needless to say, this can make us a little high strung. 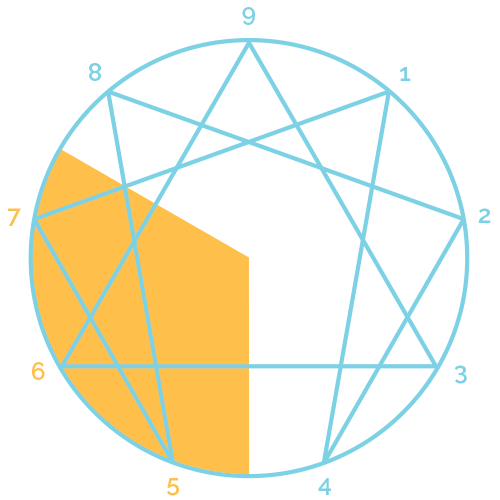 The types in the Head Triad reside at the left of the Enneagram and include types Five, Six and Seven. These types are looking for a sense of certainty, and the primary affect is anxiety or dread which is the natural response of Head energy when we don’t have a grounded experience of our own inner guidance. We must note here that these types are not the only ones that experience the issues of the Head Triad. They’re simply the types whose egos are structured around the reactivity that results from a disruption in the experience of fully connecting with the Head Center. The Five experiences the loss of connection with the Head Center as being left vulnerable and alone in a scary universe. They feel as if they are fundamentally unprepared to go it alone and there’s a sense of panic and perhaps even betrayal that their source of guidance was taken away too soon. Early on, young Fives discover that they’ve got a mind that’s capable of keen observation and they over-express Head energy and begin to put their trust in their thoughts about life rather than in their ability to engage with it directly. This results in a desire to retreat to figure it all out so that they’ll then be prepared for any eventuality. The problem is that Fives (depending on the Level of Development) can never prepare enough for every scenario and therefore they can become more and more detached and isolated from real sources of support. The Seven experiences the loss of connection with the Head Center as being cut off from knowing how to access all the good things in life before they were adequately nurtured. There’s a distinct sense of missing out and Sevens feel ripped off. There’s also an experience of painful deprivation and anxiety that they’ll never be fulfilled. Early on, young Sevens learn to self-soothe this anxiety with transitional objects (a substitute for nurturance that helps a child transition toward independence, like a stuffed toy or security blanket). But Sevens get somewhat arrested at this stage and project onto the external world at large their expectations of fulfillment. They under-express Head energy as they put their trust in the external world as their source of nurturing and security. 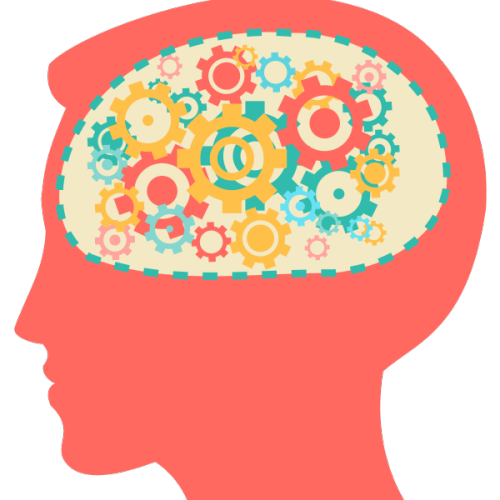 This is not to say that Sevens aren’t intelligent because Head energy isn’t about what we think of as intelligence per se, but rather about our ability to still our minds so we can receive the wisdom that comes to us. In fact, many Sevens are quite brilliant and exhibit an ability to synthesize vast amounts of information very quickly (Ken Wilber is an example that comes to mind). Depending on the Level of Health, Sevens are increasingly propelled toward the external world and avoid downtime to avoid the sense of deprivation, becoming aggressive and demanding as their anxiety increases. The Six experiences the loss of connection with the Head Center as a loss of all support, structure and protection in the universe. Sixes feel abandoned and forsaken and neither trust themselves to be up to the tasks of life, nor do they trust the external environment to be an adequate source of support. Sixes compensate by becoming vigilant, questioning, doubting and continually scanning the environment for potential dangers. The Six is the primary type in the Head Triad meaning they’re the most disconnected from the Head Center and both under- and over-express Head energy. They under-express by sourcing their guidance from the external environment because that seems more trustworthy than their own inner guidance, but they also over-express Head energy by holding some trust in reserve as they poke, prod and continually question those external sources of guidance. The problem is, Sixes are rarely satisfied even with the people, institutions, ideologies, etc. that they’ve chosen to trust. Depending on the Level of Development, they can even be said to be more trusting of their own mistrust and cynicism because they feel safer assuming that their trust will eventually be betrayed. As anxiety increases, Sixes can be prone to continually testing everything and everyone which erodes their own sense of security as well as the relationships and support networks they’ve built.